(11/14/17) Additional update notes added below in purple. As you've probably heard by now, our current tentative release date is 11/15. This is the planned date set by LINE, so we all have our fingers crossed that it doesn't change. If anything changes, (probably even if everything goes according to plan), we'll be back to keep everyone in the loop. Again, we really appreciate everyone's patience while we get this update out! We've submitted the builds to LINE QA for review. Once those builds pass and are good to go, we can send em off to Apple for the final check! Once we nail down a more solid date, we'll post another update. As always, we really appreciate your patience while we get these updates out! (10/26/17) Additional update notes added below in red. The new 1.6.0 update will be going LIVE in early November - notes on what you can expect below! Made significant changes under the hood to how projectiles and other texture assets are allocated, significantly improving performance and stability (especially on lower end devices), particularly during high intensity moves like Big Band’s BB3 Strike Up The Band. Double’s origins are a complete mystery. 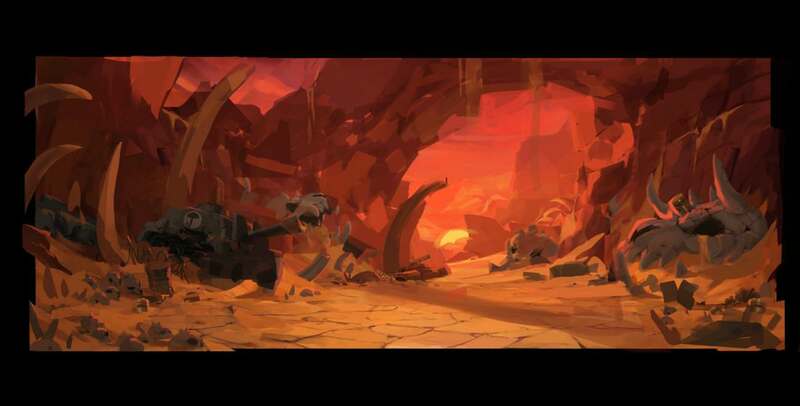 Seemingly without a will or motive of its own, this formless monster aids the Skullgirl. 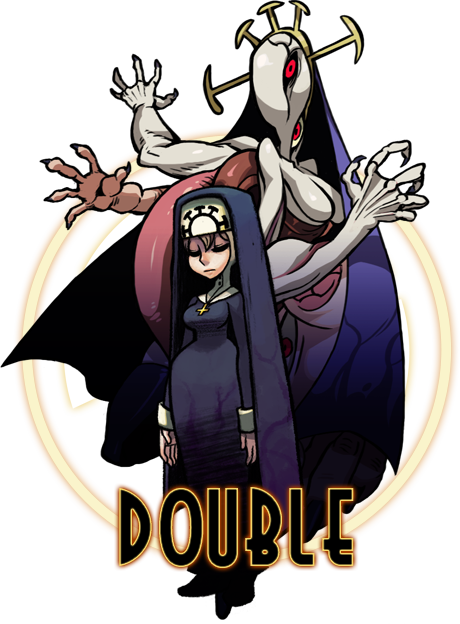 Double is capable of transforming its nightmarish form into that of any person, but often appears as a smiling nun. It can frequently be found in the Grand Cathedral of the Divine Trinity, listening to confessions and attending to the catacombs beneath. Double is designed as a technical, opportunistic character - high damage and low health, she uses her TRANSMUTATION Character Ability to adapt to different scenarios in battle and turn them to her advantage! After BLOCKING without being hit for 1 second, Double will switch to a new random element. In addition, Double’s Elemental Advantage is increased, and her Elemental Disadvantage is decreased. 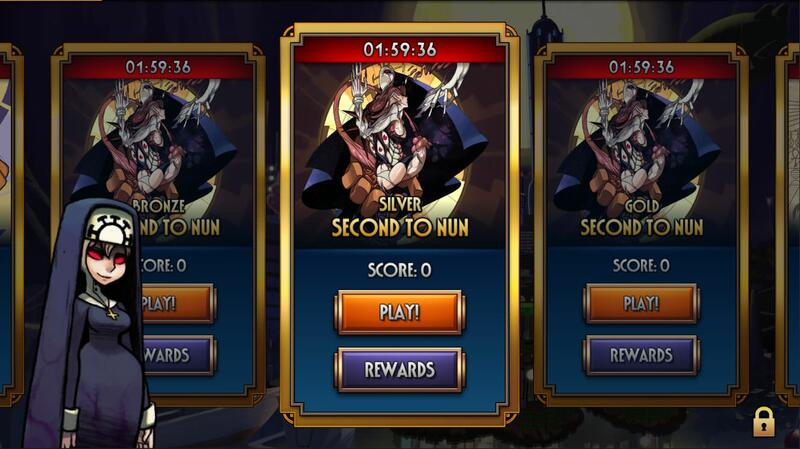 Double will have 7 new Fighters available via the UNSPEAKABLE RELIC, available every Friday (along with her Daily Event). NOTE: Each of these Fighters are at Level 1 with NO Skill Tree upgrades. For more details on these Fighters and their Signature Abilities, stay tuned to our Twitter, Facebook, and Instagram accounts -- we’ll reveal more clues about them as we approach the 1.6 update! We will update this post with new data as it is released. Double has a wide array of moves that include glimpses into some upcoming, yet to be released characters! You will be able to get Double’s Moves from ANY MOVE RELIC (and Double’s Daily Event) as soon as 1.6.0 goes live. There will also be a set of 3 new Double Prize Fights that will be going live soon after launch. We’ll update this post once the actual dates have been finalized! Finally, a “feel good” Origin Story! Oh wait actually nvm. UP NEXT: Cerebella, Parasoul, and many more! Valentine’s Origin Story introduces a BRAND NEW STAGE - No Man’s Land! 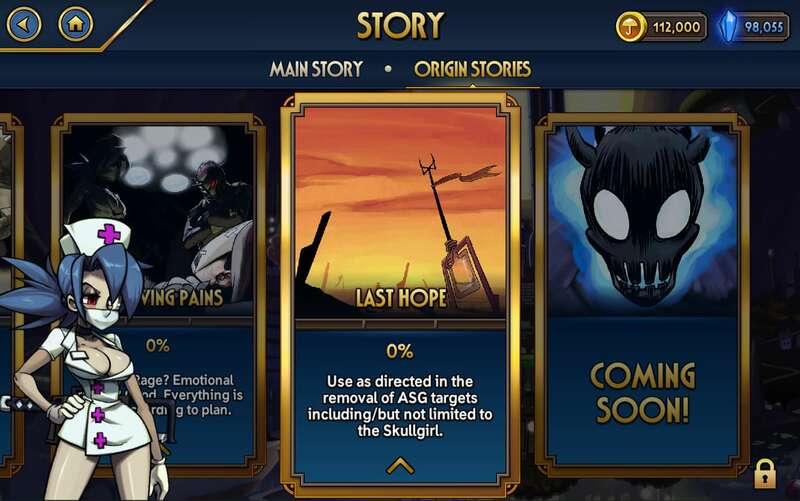 In addition to her Origin Story, No Man’s Land will now randomly appear during Prize Fights as well. Now, instead of ONLY overwriting a player’s “Snapshot” team in a Prize Fight if their new team has a higher FS, we will also overwrite the team if the new team FS is within 25% of the FS of the current Snapshot team. This will help to create more variety in Prize Fight opponents, especially at higher levels (less Cerebellas)! Buzzkill’s Hemorrhage SA will now activate more than once per fight and will display the proper percentage in its description. Fixed bug that would sometimes cause Shadow of Impending Doom to not actually drop any items ._. Fixed bug causing the Unflinching modifier to look like it is “stacking"
GOOD NEWS: The game you download from the App Store is now almost 50% smaller! BAD NEWS: Now there’s more data to download once you load up the actual game. Trade offs! For the holidays, we have reduced Energy Refresh cost from 10 Theonite to 5 Theonite per Fighter. Enjoy! Luke, Spark Shark, LemonTea27 and 10 others like this. Cool beans. Thanks for all the hard work you guys put in! Boogiepop, LemonTea27, moisterrific and 1 other person like this. Element switching is a neat thing. Really curious to how that shakes out in gameplay! I also love how Double's card designs are so ridiculous. Looks like we have to Prepare for Trouble! Hidden Variable has just made it Double! Elemental switches on the fly seem like a fun idea, meaning you have a chance to take on any fighter in the game with little fear. A powerful ability indeed, especially since she seems to be another glass canon like PW. Valentine's Orgin story is what I'm REALLY looking forward to: we know so little about Last Hope that even after 5 years I got the names of the doctors mixed up. Hopefully we get a deeper look into Val as a character and her team. MXDEX and MightyZug like this. Getting some good meaty stuff here, new Fighter, new Origin story and a completely new Stage that wasn't even in the original game! Some good fixes and changes too and i'm glad we got a (temporary) fix for top teams being nothing but Cerebellas! Some things i would have liked to seen fixed are missing though. Peacocks Juggle dropping certain fighters out of her combo (mainly Cerebella) as well as enemies being able to block before you can retaliate and punish, since these two were the main reasons i kept dropping Streaks in PFs. MightyZug and Luke like this. Bronycon Gaming and MightyZug like this. What a MONSTROUS update! The wait has paid off in spades! 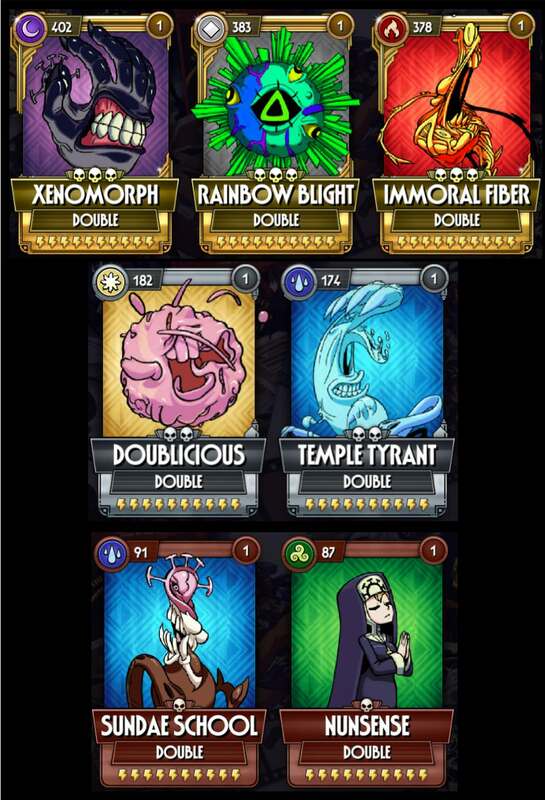 <3 Really looking forward to playing with Xenomorph and Rainbow Blight Double (I doubt I will ever get Immoral fibre), the art is vibrant and amazing! It's obvious how much work has gone into it! Perfect. 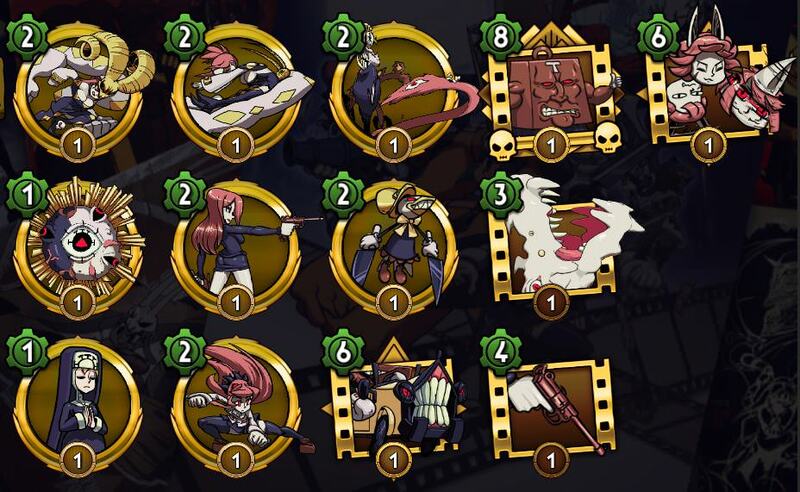 I'm surprised that they have put the only changeable color palette of all Skullgirls, in addition to the original Stage of SGMobile. I thought that Double was going to be broken, in the sense of the movements, because some "recovered" Cerebella and Peacock from the Closed Beta Test. I kind of hate the fact that after being shut out of this game for a month and a half from the Android 8 debacle that I'm still playing this game. But the constant updates and improving game modes make it too fun to stop. Looking forward to seeing how fun Double will be to play. I think rainbow blight will be the exclusive since it seems like the one people would most want. MightyZug and Ryouhi like this. Didn't mind waiting a little longer for this one because the update looks great as always! The blockbuster with Ms.Fortune now has me super hyped up. Great job, guys! MightyZug and Peacockis2cool4u like this. I can't wait for this. I wonder if Val's Origin story will bring in Oh Mai as obtainable through relics. Looks like it's time to start hoarding Theonite. HYPE! I wonder if there's going to be more Mobile exclusive moves we haven't seen in the console game! Bronycon Gaming, TRIX, Akasha_Eyre and 1 other person like this. Hopefully this update will also fix the game freezing after fights issue that's made it essentially unplayable for me since update 1.5.0. I'd love to dive back in with a new character, but not when I have to force quit the app after almost every fight. Isn't Fukua in there as well (slide kick), (Edit): wait nevermind I forgot that it was double specific. Also what move technically cause crumple in the game? SUPER glad the neapolitan ice cream Double was selected, that's my favorite. Will the new stage have new music to go alongside it? MightyZug and MXDEX like this. God I both hate and love these puns you guys come up with.